"How can we go back to Myanmar without anyone guaranteeing our security," Alam, a Rohingya refugee, told the Associated Press last week, voicing a question that hung over the refugee crisis unfolding in Myanmar and Bangladesh over the past six months. The Rohingya — a persecuted minority in Myanmar — have fled their violence in their home state of Rakhine en masse in recent months. But now, Myanmar says it’s welcoming them back home. "If we would be given homes in our villages that were burned, then we will go back," Alam said. Bangladesh and Myanmar had intended to start returning the refugees a few hundred at a time last week, aiming to repatriate all 688,000 recently displaced Rohingya refugees within the next two years, Reuters reported. But even as preparations for the Rohingyas’ return began, dozens of refugees were still arriving in Bangladesh. Since the Burmese military began carrying out violent “counter-terrorism clearing operations” on Aug. 25, hundreds of thousands of Rohingya people have fled as their villages burned, and their family members were raped and murdered. Had the refugees begun returning home last week, it’s unclear what they would have returned to. Experts and activists have said it will take many years before Myanmar is ready to safely welcome the Rohingya home — so what exactly needs to happen before then? Citizenship is a primary concern of Rohingya refugees and experts. The Advisory Commission on Rakhine State — an impartial committee chaired by former UN Secretary-General Kofi Annan, created in 2016 at the request of Aung San Suu Kyi to assess ways to improve the welfare of Rakhine — recommended that Myanmar re-evaluate and revise its citizenship laws with regards to the Rohingya last year, but their status has not changed. Earlier this month, several Rohingya elders drafted a petition calling on Myanmar to grant the Rohingya citizenship and status as an official ethnic group before any refugees return, Reuters reported. The petition also asked that the government return the land on which the Rohingya once lived to them. Since 2012, most Rohingya in Myanmar have lived in camps for internally displaced people (IDPs) and in specific townships that they are not allowed to leave. These townships are guarded by military and police forces who restrict the movement of the Rohingya for “security reasons,” Kyaw San Hlaing, the founder and executive director of the Peace and Development Initiative (Kintha) — an organization based in Rakhine, Myanmar — told Global Citizen. For years, thousands of Rohingya have lived in IDP camps, which have been likened to concentration camps, and in townships with little opportunity. But even these no longer stand for the Rohingya to return to. Using satellite imagery, Human Rights Watch determined that at least 354 villages in northern Rakhine have been partially or completely burned and destroyed. Although Myanmar has committed to building camps to transitionally shelter the returning refugees, critics worry that the lack of change in legislation means the Rohingya will be going back to live out their lives in IDP camps — which the Rakhine Commission recommended be closed in 2017 — and face the same systematic discrimination as before. “The worst would be to move these people from camps in Bangladesh to camps in Myanmar, keeping an artificial situation for a long time and not allowing for them to regain their normal lives,” UN Secretary-General Antonio Guterres said at a press conference after the repatriation deal was announced. The violence in Rakhine state, while largely perpetrated by the Burmese army, is intercommunal in its essence. Tension between Rakhine Buddhists and Rohingya Muslims runs deep and local militias made of Rakhine Buddhists supported the military’s violent crackdown, the Guardian reported. So in order for the Rohingya to be welcomed home — with or without citizenship — “building community trust is key,” Debra Eisenman, Managing Director of the Asia Society Policy Institute, told Global Citizen. “Things like having respect for all the languages spoken in Rakhine, providing economic opportunities for all, and training for local police on how to respectfully interact with everyone in the community are needed,” Eisenman said. For the Rohingya to be able to return and for there to be peace in Rakhine, Kyaw said there also needs to be a greater awareness of human rights, which is why his organization, Kintha, has run civic education programs that teach people about democracy, still new to Myanmar, and rights since 2013. “People still don’t understand what democracy is,” Kyaw said. “They think being democratic means having elections, but they don’t have an understanding of the idea of tolerance, of human rights, of humanity yet. They think democracy is something that can be ‘lost,’ like if someone else win’s a seat in the government, then you’ve lost your democracy.” This lack of understanding of democracy has also added to the tension between Rohingya Muslims and Rakhine Buddhists who don’t want to “lose” their democracy to a minority. Kintha also brings Rakhine Buddhists and Rohingya Muslims together through music and discussion to promote inter-communal dialogue. “The Buddhists were torturing us, beating us and cutting us up. 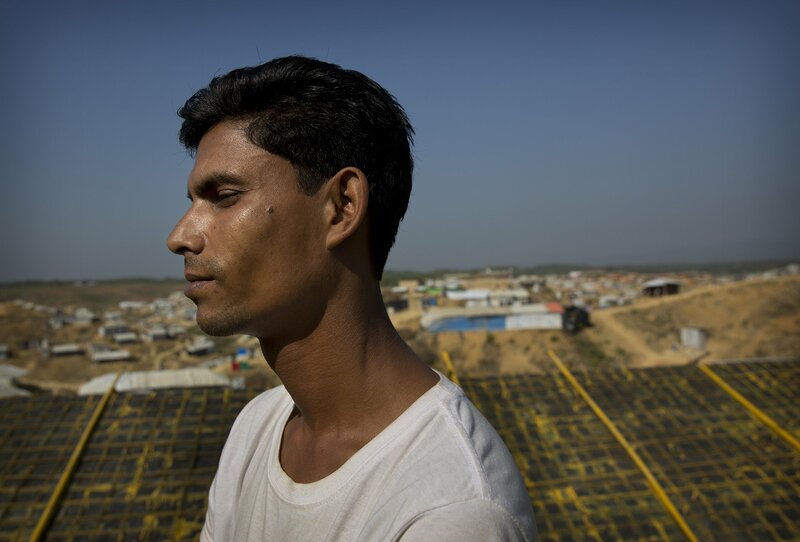 My parents couldn’t take it so they came here," Mohammad Younus, 30, a second time refugee said at the BaluKhali refugee camp in Bangladesh on Jan. 23, 2018. Kyaw, who was in Rakhine when the violence broke out in August, agreed. Development and investment were key recommendations of the Rakhine Commision — and also why Eisenman said broad sanctions and boycotts of Myanmar’s industries, including tourism, as some have called for, would not be useful. That will take time — and certainly can’t be done quickly enough for the Rohingya to return home to a developed state within two years. Support for Myanmar should be holistic, Eisenman said, and should take take an approach that supports the country’s development as a whole, while strengthening the civilian government. Countries can also support Bangladesh and its efforts to support the Rohingya refugees, and work to resettle refugees to other countries as well. For nearly 50 years, Myanmar was rule by an oppressive military regime. And though the country emerged from military rule in 2011 and held its first democratic general election in 2015, it is a long way from being fully democratic. 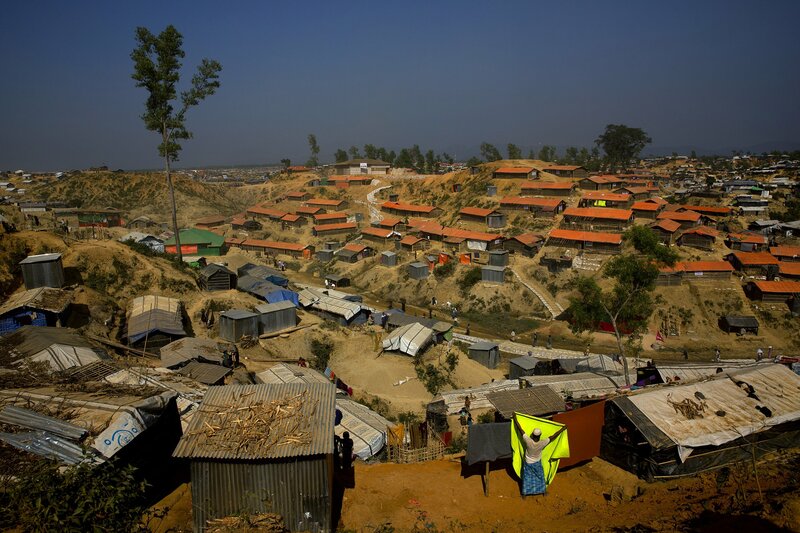 “There are a lot of birth pains to this democracy and the situation with the Rohingya is horrific and needs to be remedied appropriately and peacefully, with rights restored to them immediately, but there is a lot over all that needs to be remedied in Myanmar,” Eisenman said. Eisenman said there will also need to be changes to Myanmar’s constitution to allow for more civilian control — the military still controls 25% of the parliament — and to decades-old military strategies. Establishing peace in conflict-ridden Myanmar overall is crucial to making the country safe for the Rohingya to return and ensuring a crisis like this does not happen again. Eisenman cautioned these kinds of counter-terrorism strategies could actually encourage more violence and stoke terrorism. 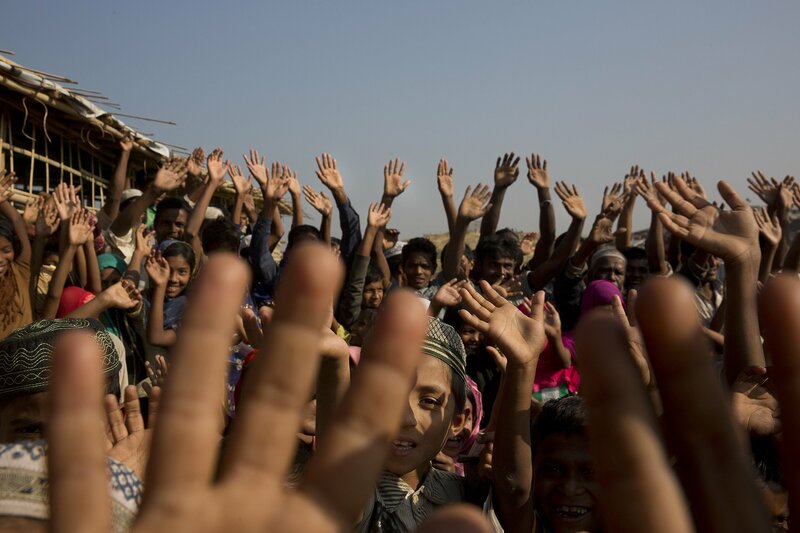 Rohingya children and refugees raise their hands and shout that they won't go back to Myanmar during a demonstration at Kutupalong near Cox's Bazar, Bangladesh, Jan. 22, 2018. As news of the brutal crackdown on Myanmar’s Rohingya captured international attention, many called for the country’s de-facto leader Aung San Suu Kyi to be stripped of her many accolades, including her Nobel Peace Prize. But Eisenman said Suu Kyi and the implementation of the Rakhine Commission’s recommendations are still Myanmar’s — and the Rohingya’s — best hopes for peace. With a better understanding of democracy and a stronger rule of law, Myanmar might have a better chance of implementing the Rakhine Commission’s recommendations. These changes will take time, but until they happen, many Rohingya refugees do not want to return home where they face an uncertain future.